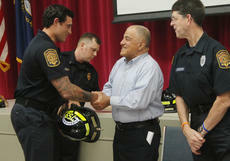 Mo Shams, retired firefighter and chaplain, congratulates Jacob Snellen on becoming a new Bardstown firefighter. Snellen was one of the graduating class of volunteers but has since become a part-time paid firefighter. Also shown are firefighters Kevin Grayson and Kerry Monin. Firefighters are like a family. They work together, eat together, share sleeping quarters and have each other’s backs when the heat is on. But as anyone who has ever been around a firehouse knows, many firefighters are actually related. It’s a vocation that runs in families. That tradition continues for the Bardstown Fire Department with its newest class of volunteers, who have completed their training and were honored in a graduation ceremony Tuesday night at the Civic Center. Chamber holds ribbon cutting for Rock Drilling Inc.
After Putin Meeting, Trump Voters Mostly Dig In. But Cracks Are Showing.